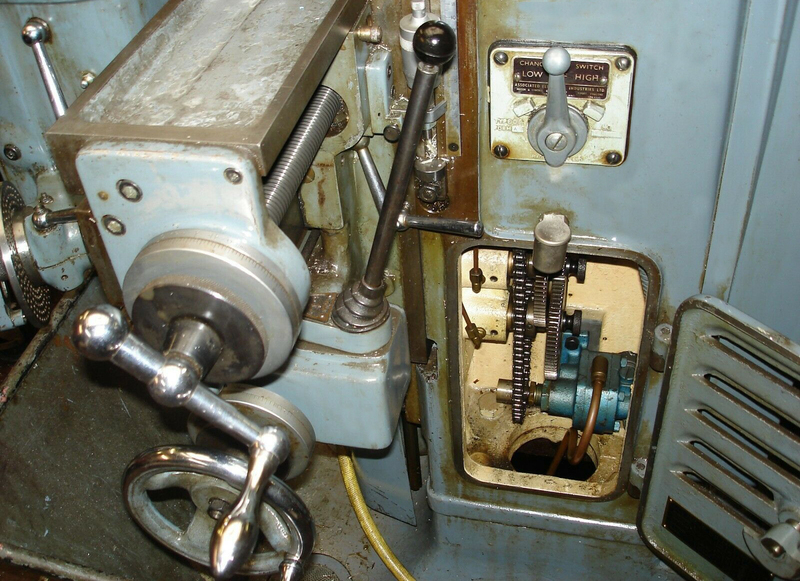 Like many other European and Russian makers the English firm of Alexander copied the original German Deckel FP1 Universal Toolroom Miller - itself similar in many ways to Maho, Thiel and other makes* . 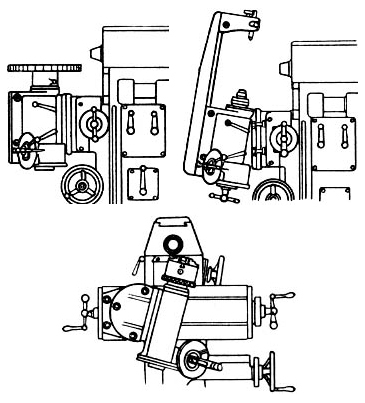 With its ingenious, adaptable and versatile design, the Alexander leant itself to solving a multitude of machining problems, the secret of the type's success being its ability to mount a number of different heads - horizontal, standard vertical and slotting - in combination with a variety of tables - plain, plain-tilting and compound swivelling. All the heads could be driven backwards and forwards across the top of the main column, by a handwheel working through reduction gearing, to provide an in-out feed, while the tables bolted to a flat, vertical T-slotted table equipped with power longitudinal and vertical feeds. By juggling the choice of heads and tables, and utilising other accessories, a skilled technician was seldom defeated in his attempts to produce the most complex of milled and drilled components - and all to a very high standard of accuracy. Alexander called their machine the "Master Toolmaker" and, as their advertising literature claimed, it really was: "The machine for the awkward job". Both vertical and horizontal sockets took a No. 4 Morse taper and were provided with an adaptor able to accept spring collets up to 11/16" bore. The standard head assembly, whether carrying the horizontal overarm or vertical head, had a maximum travel of 57/8". For the English market the drive motor was a massive built 1.5 hp 1425 rpm, single-speed 3-phase unit, mounted on an adjustable supporting bracket at the rear base of the main column. A two-speed motor was an option, but seems to have been rarely fitted. The motor drove up to the spindle gearbox (with its hardened and ground gears), through two matched-length "B" section V belts, each 56" long. With the single-speed motor 6 horizontal spindle speeds were available - 120, 190, 300, 475, 750 and 1200 rpm while the two speed motor extended the range to a more useful 60, 95, 120, 150,190, 235, 300, 375, 475, 600, 750 and 1200 rpm. The standard "vertical table" had a clamping area of 73/4" by 215/8", with 97/8" of horizontal travel and 115/8" of vertical. Fitted to the vertical table was either a plain table of 231/2" x 81/4", or what the maker's described as an "Angular Table", which was available in two sizes with clamping areas of 103/8" x 171/4" - or 103/8" x 24". The Angular Table, which made the machine so versatile, could be tilted horizontally 30 degrees either side of zero, vertically 45 degrees either side of zero - and also vertically towards and away from the machine column by 30 degrees in either direction. The distance from the centre of the horizontal spindle to the table face was 115/8". Able to be moved under power both horizontally and vertically, the table was fitted with adjustable stops that automatically disengaged the drive. 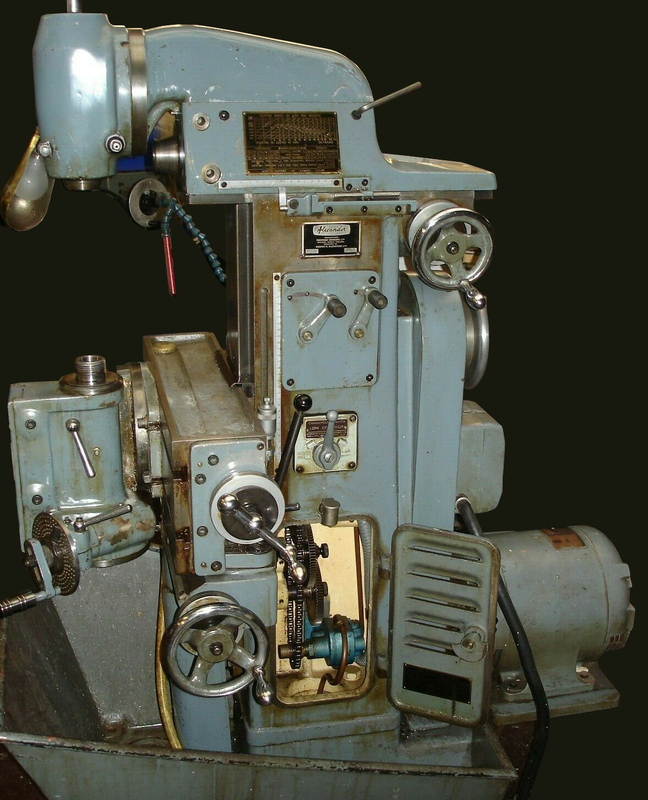 The drive, controlled by a single "joy stick" lever, gave six rates of feed in each direction with the power fed through a simple "gearbox", with the ratio changed by the operator arranging 4 sets of "pick-ff" (paired) gears in a housing built into the right-hand side of the column. It is known that the gears included (possibly amongst others): 19T, 27T, 35T, 45T, 55T, 65T, 73T and 81T. The gears, which had face-dogs to engage with the fixed gears, were slipped onto fixed studs to give the desired rate of feed with a mild-steel shear pin hidden beneath a spring cover just inboard of the lower gear. A word of warning about the Alexander vertical head: this was fitted with a 39-tooth 21-degree pressure angle gear whilst Deckel appear to have used the same gear, but with a rather old-fashioned specification of 14.5 degrees. Running the gears together is not recommended. 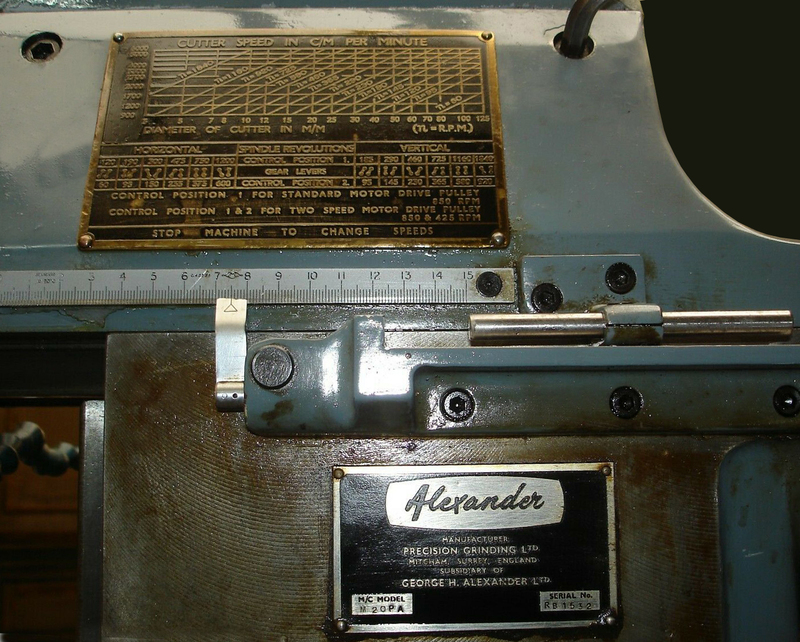 Further details of the Master Toolmaker can be found under the Deckel section of the Archive - and particulars of the useful Alexander/Deckel tool and cutter grinders here. Alexander/Deckel standard vertical head. When fitted with the single-speed electric motor six spindle-speeds were available of 190, 300, 475, 750, 1200, and 1900 rpm. With the two-speed motor the range became: 95, 150, 190, 235, 300, 375, 475, 600, 750, 950, 1200 and 1900 rpm. The head could be swivelled 45 degrees either side of vertical, had a quill movement of 23/8" and could be traversed in and out for a total of 57/8". The No. 4 Morse taper was provided with an adaptor to take spring collets with a maximum bore of 11/16". A high-speed vertical head was also available, equipped with its own motor drive and capable of reaching 6000 rpm. The slotting head is one of those items that can sit unused on the shelf for months but, when needed, proves to be a most valuable and versatile accessory. Depending upon the motor fitted, six slotting-stroke rates from 48 to 475 or twelve from 24 to 475 were available. The head would swivel 35 degrees from vertical and the length of stroke could be adjusted from 0 to 3". Like the vertical head, the unit could be traversed horizontally in the direction of the horizontal spindle by 57/8"
In combination with the tilting table many difficult jobs could be tackled with relative ease of setting up. Fitting a boring head to either the horizontal or vertical spindle opened up a host of new possibilities for both simple and complex boring operations. An expensive, beautifully made, versatile and now highly-sought-after Universal Dividing Head was available for the miller. It was designed for direct or indirect dividing and for any angular pitch in degrees. For indirect dividing the worm was swung into mesh with the wheel and the appropriate dividing plate mounted on the fixture. For direct dividing the worm was clamped in the disengaged position and movements of the spindle then controlled by a plunger engaging in a plate provided with ten notches. 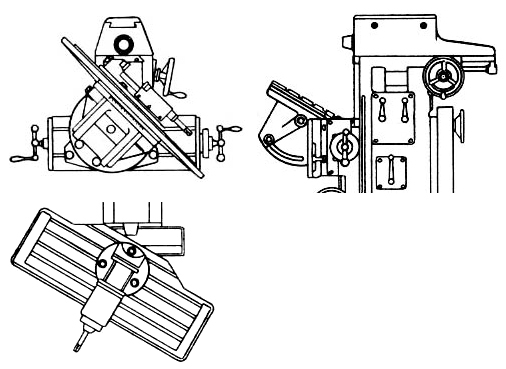 Some of the many mounting arrangements possible with the dividing head and its over-arm accessory.